Bringing You Clean Food...And So Much More! The land at Little Creek Acres has never been farmed with chemicals or pesticides. Developed from virgin soil in the early eighties, it is a perfect site for ongoing demonstration of sustainable agriculture. The plants we harvest and make available to the public are in themselves demonstrations of the efficacy of sustainable agriculture practices. Our sustainably grown "Clean Food" is not only toxic-free; it is grown in healthy, nutritionally balanced, vital soil to encourage the highest nutritional content. From time to time some of the harvest is available to the public through a program that is important to the ongoing promotion of sustainable agriculture and self-reliant, harmonious living: CSA, Community Supported Agriculture. A way to make a difference . . .
Community Supported Agriculture (CSA) is a joining together of concerned individuals who are dedicated to involvement with a new paradigm for clean food production and consumption. The major function of a CSA is to provide a win-win situation whereby the consumer has a direct relationship with his or her clean-food source, and the small farmer has a guaranteed market and appreciative support for environmentally responsible farming. CSA's are also known as subscription or shareholder farming operations. While each CSA is uniquely set up, there are some basic elements that typify most CSA's. The members and the farmers are committed to clean (non-toxic) food and environmentally responsible agriculture practices. CSA members or subscribers purchase "harvest shares" from their local small farmer in advance of the growing season. This advance payment helps the small farmer plan and prepare for the next growing season. The member receives a fresh-picked share of the harvest, generally on a weekly basis. 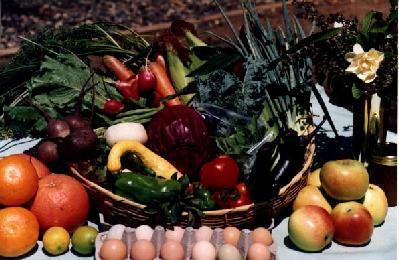 The volume of food is often for two adults and a small child, with the member accepting less if a crop is damaged or fails. The farmer-member relationship varies in closeness, usually relative to the size of the CSA and the willingness of the farmer and members to give additional time to each other. CSA's are not an outlet for cheap food. They do, however, provide fresh, clean food at prices that are comparable or slightly higher than those for unknown-point-of-origin, chemically grown food. The 1998 cost of a share ranges between $17 and $35 per week, depending on the size of the share, and whether annual or monthly shares are purchased. In today's marketplace, most produce managers are not knowledgeable about the growing environment or where the produce items are grown. Produce grown in other countries have virtually no quality control on growing practices. Genetically-tampered produce does not have to be labeled as such. As CSA members, we know where our food is grown, under what conditions, with what growing methods, and by whom. We have an opportunity to make a choice as to which community, farmer, or farming practices we want to support with our commitment to purchase. As consumers, having a direct link with the farmer who grows our food has many benefits. Direct, local CSA purchasing guarantees fresher food; more vital and nutritious. Better tasting food is available because varieties do not have to be chosen for long shelf-life, or transportability. In-season produce is held by many to be more naturally harmonious to the needs of our human biological systems. And farm-visits, whether recreational, serviceful, or educational, are another enrichment benefit of CSA participation. CSA enrollment is a vital contribution to the stewardship and well-being of our planet and our loved ones. The Little Creek Acres CSA Program offers you all of the basic elements of most CSA's. You will have year round fresh produce with delicious home-grown flavors. Your produce will be grown without pesticides, chemical fertilizers or harmful sprays. You will know where your food is grown, how it is grown, and by whom. You will be helping to preserve and promote the family farm model. You will be promoting clean food and sustainable growing practices. You will be connecting responsibly and directly with your food source as the world of supermarkets and agribusiness becomes increasingly impersonal and profit-oriented. You will be exercising your right to choose. Important Additional Benefits . . .
You will find a warm, friendly, inviting environment totally supported by volunteers who care about you and your well-being. Having an opportunity to meet the actual people who till the earth and care for the plants and trees provides you with a connection to the food and its growing environment. Your subscription will be a contributing part of the Little Creek Acres commitment to preserving and promoting environmentally responsible farming and the values inherent in a family farm setting. As a nonprofit demonstration farm, it is a part of our mission to promote sustainable agriculture awareness and education. Our agricultural concerns go beyond the lack of toxic substances to include the fundamental needs of soil fertility management to produce nutritious as well as non- toxic foods for maximum health. We commit to be there for you to ask questions and learn from us. Informal exchanges, farm tours, structured classes and volunteer opportunities will all be available to you as a Little Creek Acres CSA program participant. Training volunteers takes time and energy, but we feel that having an opportunity to participate in small-scale naturally grown food production brings a greater appreciation and understanding of the wonders and bounty of Mother Nature and the needs of Planet Earth. We invite you to join us in this endeavor as often as you can. Little Creek Acres CSA Harvest Shares come in two sizes, Hefty Harvest Shares & Single Harvest Shares. Hefty Harvest Shares provide enough naturally-grown fruits and vegetables for two adults and a small child, or two vegetarians; Single Harvest Shares provide enough for the average appetite of two seniors or one vegetarian. Fresh-picked, delicious harvest shares will be available for pick-up at the farm on a regular weekly schedule. The content of the shares will vary with the seasons and the crop development. We are not able to accommodate personal preferences by making substitutions, additions, or deletions. Unwanted items can serve as welcomed gifts to neighbors, friends, or the needy. Honoring Nature's Way. . .
Over the course of a year, we anticipate being able to provide 32 vegetable varieties, 22 fruit varieties, 4 herbs, and a variety of cut and edible flowers in our Harvest Shares. As an extra service, from time to time during the year we may also have solar-dried foodstuffs, honey, and eggs available as augmented purchase choices. Even so, please bear in mind that the selection will not be like going grocery shopping at the supermarket because we will be growing in-season, locally-adapted crops. We welcome your suggestions for planting varieties, and we will plan for well-balanced and diversified growing seasons. Having researched the experience of other CSA's, there are a couple of things we want to mention. CSA members are pleasantly surprised at the experiences of learning to eat and cook with lesser known in-season produce. We will always be available to teach product usage. Feel free to call us for suggestions and/or recipes. The other inevitable happening is that the best laid plans of experienced farmers are often no match for the whims of Mother Nature! So it is bound to happen that there will be shortages of some things and a surplus of others throughout the year. These inevitabilities offer us all an opportunity to observe and honor Nature's way. We believe that our CSA Harvest Share Subscribers are among the most fortunate people on Earth today! The Harvest Shares are grown by volunteers who contribute their time and energy to keep the farm going. Their dedication to wholesome food and preserving the small family farm as an American way of life is instilled in the care and appreciation they give in every aspect of the farm operation. The abundance, variety, and quality of the Little Creek Acres Harvest Shares is a bounty few people on our planet have access to at this time. We offer the Harvest Shares with gratitude for the opportunity to keep the vision alive and before the public, and with the hope that more people will recognize that they do have a choice in their health and well-being and that they will be more willing to support the efforts that make that choice possible. We believe that CSA is the wave of the future for both small family farms and for thinking, caring people.